This juice is very refreshing. Enjoy for breakfast or as a snack. 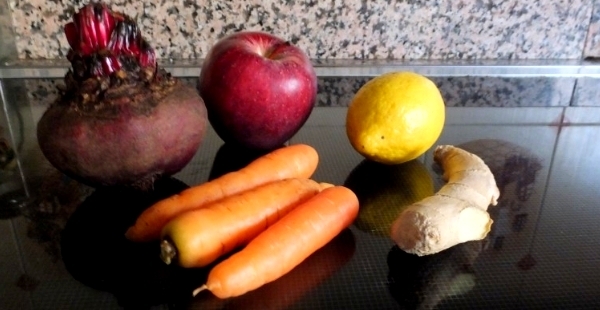 Beetroots, apple, carrots, lemon and ginger are an awesome combination! Peel apple, beetroot, carrots, lemon and ginger. Juice all the ingredients with a juicer. Alternatively blend all ingredients with a liquidizer and then filter juice with a nylon bag or sieve. You can blend the remaining pulp with a banana and eat later during the day.